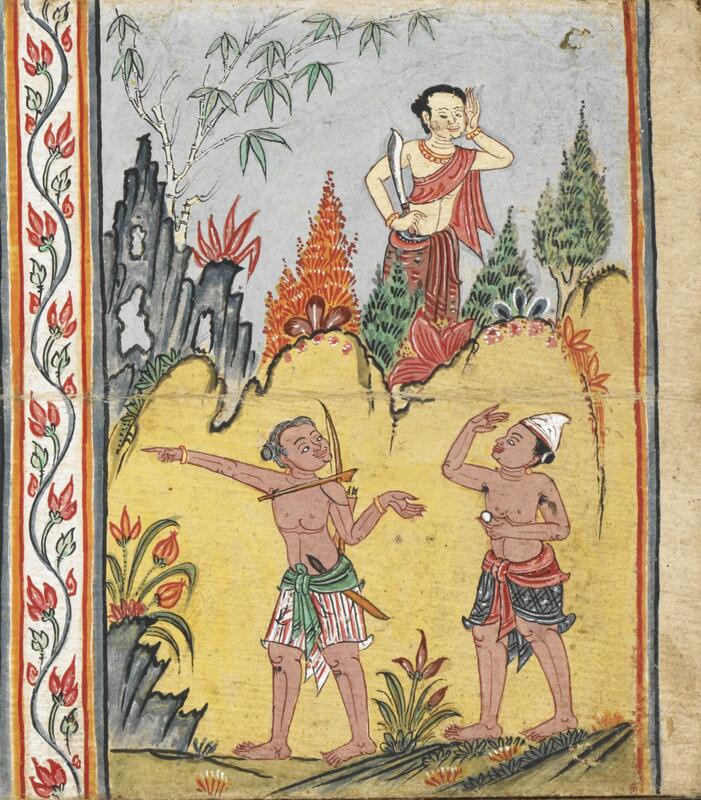 Studies focused on gender in Southeast Asian societies have emerged, in recent decades, in approximate concurrence with the development of regionally focused Southeast Asian art histories. The founding premise of this international symposium is that there has hitherto been insufficient discursive intersection between these two fields. 3. Considerations of the relationships between artists and/or works of art and larger Southeast Asian cultural constructs of gender, as enacted in political, economic, religious and other domains. Proposals will be particularly welcomed for papers that address what new perspectives and methodological approaches are brought to the fore through studies that are attentive to gender, and/or that re-assess art historical narratives through the lens of gender. Histories of art from antiquity to the present will be considered, in the hope that intellectual exchange between scholars working on the “pre-modern,” “modern,” and “contemporary” will be mutually generative. As the first symposium of its kind, Gender in Southeast Asian Art Histories aims to establish the parameters of current research, and to develop inter-disciplinary and transnational frameworks for future studies in the field. To this end, proposals are invited from researchers working in and between a range of disciplines, including but not limited to: archaeology, area studies, comparative literature, gender studies, heritage studies, history, film studies and media studies, in addition to art history. In addition to more established scholars, early career researchers (including postgraduate researchers) are particularly welcomed. The conference organizers are pleased to offer selected participants financial assistance toward the cost of travel and accommodation, with preference given to those based in Southeast Asia. In developing scholarly networks, the event organizers will also facilitate international collaborations and mentorships, in which early career researchers accepted for participation will be given feedback on their presentations, and encouraged to submit their papers to the scholarly, peer-reviewed journal of the Asian Studies Association of Australia, the Asian Studies Review (indexed in Scopus). The symposium will be launched by a keynote address from Professor Ashley Thompson, the Hiram W. Woodward Chair in Southeast Asian Art at SOAS, University of London. Symposium participants and up to twelve additional attendees, on a competitive basis, will also be invited to participate in a half-day masterclass led by Professor Thompson, and a professional development workshop. Abstracts in English of approximately 500 words, as well as biographical statements of approximately 100 words, should be sent to yvonne.low@sydney.edu.au before 28 February 2017. Applicants seeking support for travel and accommodation expenses should also include a short statement of financial need. Gender in Southeast Asian Art Histories is convened by Yvonne Low, Roger Nelson, Clare Veal, and Stephen Whiteman. The event is generously supported by the Asian Studies Association of Australia, the Power Institute, the Sydney Southeast Asia Centre, and the School of Literature Art and Media at the University of Sydney. The latest issue of the SEALG Newsletter (2015) has been published and is now available online at http://www.sealg.org/pdf/newsletter2015.pdf . Included in the Newsletter is the report of our group’s Annual Meeting that took place in July 2015 in Paris. This Annual Meeting was the second successful collaborative conference with the South Asia Archive and Library Group whom we owe a debt of gratitude. The theme of the conference “The French Connection – with South and Southeast Asia” gave us the opportunity to look at Southeast Asian materials from a different angle. 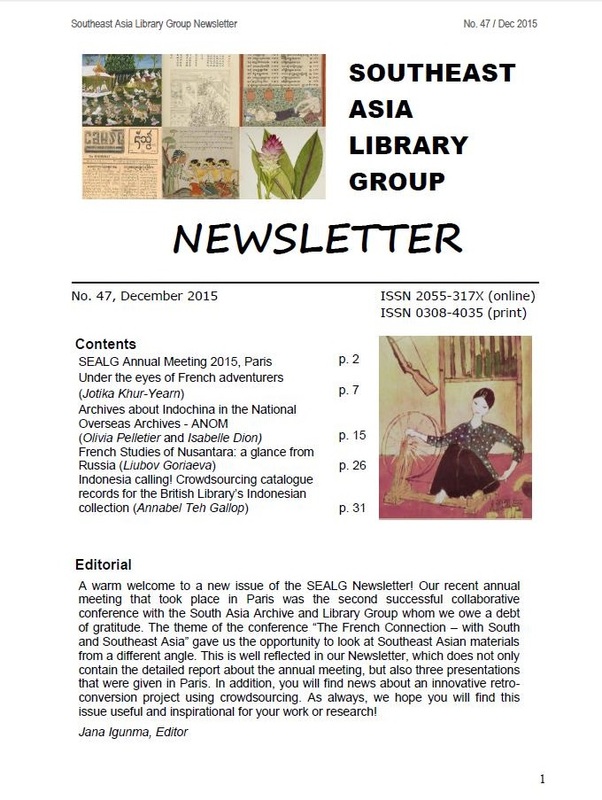 Previous issues of the Newsletter in electronic format are available on the SEALG homepage. We have the pleasure of extending to you the information of the forthcoming 6th SSEASR Conference on Heritage in the History, Culture and Religion of South and Southeast Asia. This international Conference of the South and Southeast Asian Association for the Study of Culture and Religion (SSEASR) which runs under the International Association for the History of Religions (IAHR), is rated as one of the best South and Southeast Asian conferences on history, culture, religion, languages and civilizations in the world under the aegis of the CIPSH, UNESCO. The Conference is being organized by the University of Kelaniya, Sri Lanka in collaboration with the International Association for Asian Heritage (IAAH) and Sri Lanka Association of Buddhist Studies (SLABS) in Colombo from June 04 to June 07, 2015. It is also planned to organise a post-Conference tour (June 8-11). More information on the SSEASR and the Conference will be available from the website http://www.sseasr.org. All scholarly books experience a brief moment of freshness at publication. Thereafter they age, some gracefully, while a select few works mature becoming timeless classics in their field. However, far too many studies wither under the pitiless sun of passing time, fading into irrelevance. Sadly, most books do not become utterly irrelevant, let alone valueless; they are simply forgotten. And yet, time and again, something happens in the world that apparently is new but which is beautifully explained – given context – by one of these old texts. NIAS books are not immune to ageing, either, but NIAS Press have decided to do something about the obsession with new and the stampede towards obsolescence – hence the launching of a new website with which they aim to link current events (especially in Asia) to Asia research published by NIAS. Their new blog, NIAS Inside, is a website demonstrating that fine scholarship is timeless and it will be worth watching. More information and the latest NIAS Press catalogue can be found on the NIAS Press homepage. The European Association for Southeast Asian Studies (EuroSEAS) will hold its 8th conference from 11 to 14 August 2015 at the University of Vienna and the Austrian Academy of Sciences in Vienna, Austria. As an international and multi-disciplinary organisation, EuroSEAS invites scholars and PhD students from all academic disciplines with an interest in Southeast Asia to submit panels that explore relevant research topics from an interdisciplinary perspective as well as discuss theoretical and methodological aspects of research generated in the field of Southeast Asian Studies. Scholars are also encouraged to submit proposals for roundtable discussions about recent developments in Southeast Asia to euroseas@kitlv.nl. Keynote Speakers for the event will be Benedict Anderson and Ayu Utami. EuroSEAS will also provide facilities for scholars and filmmakers to screen documentaries. This call closes on 30 September 2014. Individual registration starts from 30 September 2014 onwards. For updates, please visit the conference homepage. A new, co-operative effort – including South East Asian Studies – of Leiden institutes and musea. LeidenGlobal is a community of leading academic and cultural institutions in the Netherlands. Through LeidenGlobal, academic and cultural institutions connect with local communities, media, government, business, and NGOs. The aim is to raise the impact of scholarship across the board, from cultural events and public debate to government policy and education. Participants of LeidenGlobal have expertise about Africa, Asia & Oceania, Europe, Latin America & the Caribbean, the Middle East, North America, Russia & the Caucasus, and the Circumpolar Regions. LeidenGlobal is a meeting place built for people interested in places around the world, and the dynamics between them, their histories, and their cultures. LeidenGlobal provides information on events, collections, courses, academic institutions and experts based in Leiden. As of July 1st, 2014 the care of the collections of the KITLV will be transferred to the Leiden University Library (UBL). All books, periodicals, archives, photographs, maps and print collections etc. will be moved to the UBL buildings – situated just opposite the present location of KITLV. The acquisition of books and periodicals will in future be a task of the UBL, a steering committee consisting of representatives of the UBL, the Royal Netherlands Academy of Arts and Sciences (KNAW) and KITLV will oversee consistency. The present reading room of KITLV will close on the date mentioned but it is hoped that about a week later requests for books, periodicals etc. can be fulfilled at the UBL building. A separate reading room for KITLV is planned and current periodicals and manuals will be available there. Within a few years the UBL plans to open an Area Studies Library with its own reading room, in which KITLV will be incorporated. A large part of the present library staff of KITLV will have to be made redundant, the remaining staff will be employed by the UBL. KITLV will continue as a research institute of the KNAW, located on the Leiden campus. The management of KITLV’s Jakarta office will be taken over by the UBL. It will maintain its functions of acquiring books and periodicals published in Indonesia and of supporting the research institute. These developments are in consequence of a retrenchment-, reorganization- and relocation- operation by KITLV’s parent organization, the Royal Netherlands Academy of Arts and Sciences in Amsterdam.